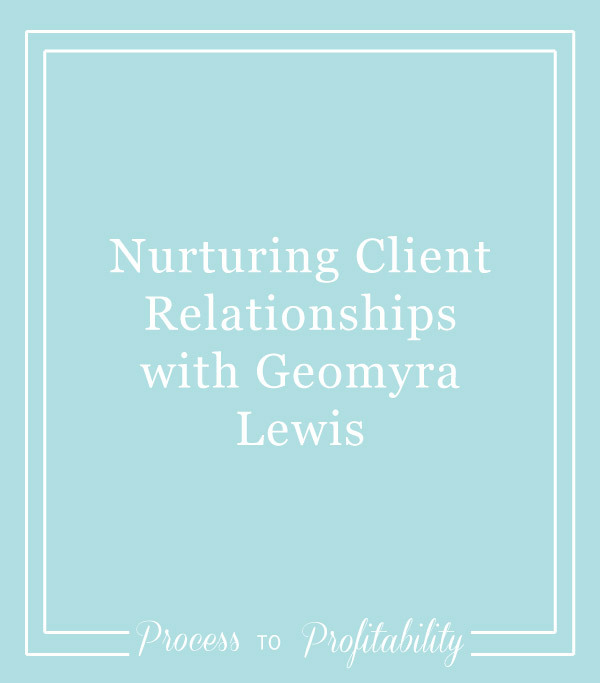 Today I’m talking about nurturing client relationships with Geomyra Lewis Pollard. We get into some really great topics for anyone who works with clients in their business, including the best way to begin building a relationship with someone you want to work with and how you can balance giving your clients enough information without overwhelming them. We also talk about some of the ways you can make your clients feel special during their time with you can after the project has wrapped up. Geomyra also gives some advice on building vendor relationships with the people who are serving the same clients that you are so you can create referrals and build a team so you can offer your clients with best services possible through people you enjoy working with. Geomyra Pollard is the Creative Director behind Geomyra Lewis Weddings and Events (GLWE) and Entrepreneur Encourager at Coaching for Creatives. A native of the Washington DC area, Geomyra is the daughter of George + Myra. She is passionate about her family, faith and focuses on what matters most. With over a decade of experience in the weddings and events industry, Geomyra has a stellar reputation among her clients and colleagues as being a detail-oriented planner. She is known for producing jaw-dropping events, while managing her clients, the GLWE team and creative partners with ease and poise. As an entrepreneur encourager, Geomyra finds joy in working with creative entrepreneurs as they work to build meaningful brands and businesses. She believes we should do all things with grace, passion, and purpose. Geomyra is married to her high school sweetheart and is the proud mama of Payton and Jackson.